It is now Friday morning! My parents, sisters and their husbands wanted to go to the Zoo, Jared and I on the other hand did not. So my parents willingly took the girls with them to the zoo. The girls had a fun time, while Jared and I went shopping to get food for the trip home and we ran a couple of more errands. It was actually a nice quiet time for us. We sent the girls to the Cheyenne Mountain Zoo with the camera so that they could take pictures of their trip. The Moose that they saw! A Bear that they saw! The girls cousin Brody! My sister Elena's son! Needless to say, the girls had a fun time at the Zoo with Grandma and Grandpa, but they didn't take very many pictures. That night Jared and I went and met up with some friends of ours, and had a wonderful time catching up. On Saturday we headed over to Widefield High School, where Jared and I both attended HS, one of the reasons we went to CO this summer was for Jared's 20 year reunion. OMGoodness, am I really that old? Of course the other was to spend time with all of our family. So, back to the reunion, they planned a picnic lunch at the HS, we had alot of fun showing the girls around the halls, and showing them were some of our classes were. The funny thing for us was that some of the areas were closed for asbestos removal. They were removing asbestos while we were in HS and after 20 years they are still working on it. The HS isn't that big. Oh, Well! One of our memories of HS is the big gladiator that is the HS mascot, and is huge, and stands in front of the school, so we took the girls over to him to get their pictures taken. That night we went to a restaurant for the official part of Jared's HS Reunion. We had a nice time catching up even more. Jared is glad that he decided to go to his reunion. I am still debating whether or not to go next year to mine. We truly had a wonderful trip, and enjoyed spending time with our family. One of my favorite parts of the trip is when we got to meet Brody for the first time, I thought that he would be shy and cling to his parents, but boy was I wrong, he is a big flirt, I put out my arms and he walked right up to me. One of the funniest parts of the trip was when the girls were trying to teach their Uncle Mike how to "Skin a Cat". When Sunday rolled around we were glad to be heading home. Our drive home was real quiet, because we were minus 2 girls, Breanna and Amber had the opportunity to stay and extra week and Uncle Justin brought them home August 2nd. They had a fun time, but they were ready to come home. Hope you enjoyed our many post about our fun vacation to CO! Well, it is Wednesday night and we are at my parents home now. We truly had a fun time visiting with everyone, but we have decided that we will do things differently the next time we come to CO. When we left John's home it was right at the beginning of rush hour traffic. What were we thinking? Jared was really tired, the girls were really tired, I was really tired. It took us 1 hour to drive through Denver, this had to have been the longest ride from Denver to Colorado Springs I have ever taken. Needless to say we just rested when we got to my parents home. On Thursday morning we went to Rock Ledge Ranch, when I was growing up it used to be called White House Ranch. The girls had a fun time learning about the family that lived there, and looking at the first home that they had, then the second, then the third and how they gained more amenities every time they built a home. Candace helping cut wood the old fashioned way! 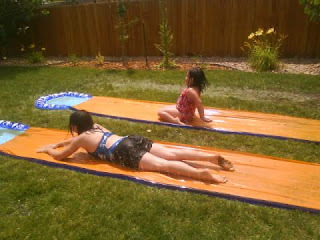 Breanna with her cousin Mallory! Jodi with her cousin Tayloranne! For dinner my parents made reservations at one of the coolest places I have ever been. If you are a cowboy or a cowboy at heart you have to check this place out. We went to The Flying W Ranch. This is a working cattle ranch, and they have a small part of their ranch set up as a small western town. You can go and tour the town, they have places like a school, a library, a drug store where you can get old fashioned candy, you can watch them shoe horses, but the best part is they feed you a real chuck wagon dinner, and then after dinner you get a show, the Flying W Wranglers sing for us. Jared with his girls and Tayloranne and Mallory(cousins)! He bought himself a cowboy had, and all the girls a cowgirl hat. I can't wait until October when it is cooler to get our family pictures done...I have got such a cute idea for matching clothes to go along with all of the hats. This is all I have time for today! I will finish our trip in the next post! After we got home from the Butterfly Pavilion, we decided to hang out and rest at John's home. Now, I am sure you are asking yourselves, "Did they really rest? ", I can totally understand this question...because we haven't rested at all since our vacation started. Well, the answer is no, we did not rest. 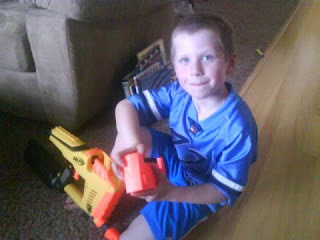 Jared came across a dart gun and decided that all of the children needed one. 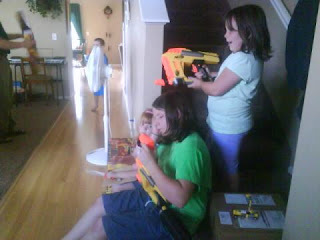 So off to the store he and John went and came home with some wicked dart guns. The men and the children played non-stop for almost 3 hours. We didn't get very many pictures of this, because it was hard, they kept running around for some reason. 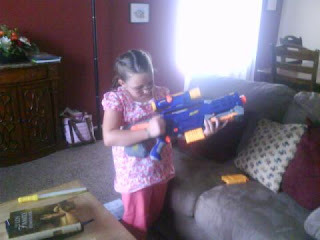 Jodi with a semi-auto dart gun! 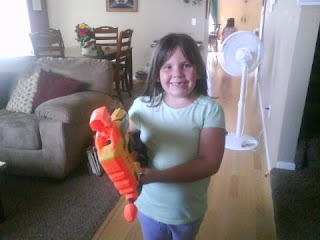 Amber with her sniper riffle dart gun! That night after we got the children into bed the adults played "Hand and Foot" until about 1 in the morning. Boy were we tired the next day. While the parents were tired, the children wanted to play some more so we took them to a really nice park. 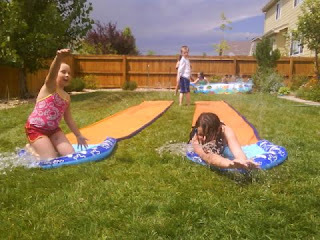 In the afternoon we let the kids play in the water, until it was time for us to head down to my parents home. 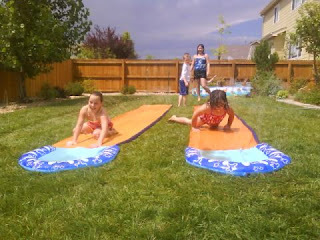 Breanna and Jodi racing down the slip n slides. I think this was tied! 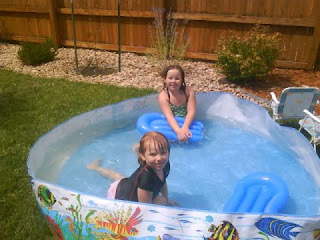 Candace and Morgan hanging out in the Kiddie pool! After our fun trip to Graffiti Falls, we headed back to Justin's home, there we ate dinner and washed all of our wet clothes. We then headed up to visit Jared's brother John and his family who live in Thornton, CO (north of Denver). The first day that we were there we went to the Butterfly Pavilion. If you are ever in the Denver area you should go here. I learned more about bugs and butterflies than I ever thought that I would. We, oh wait let me rephrase this, some of us were very lucky to be able to hold their pet tarantula Rosie. I was one of the fortunate ones who did not get to hold Rosie (let me add that I was glad). Our daughter Amber after having held Rosie, was grossing out quite a bit. She would not do anything with her hand and arm that touched the beautiful big spider, she actually held her arm away from her body. I finally asked her if she was ok, she then proceeded to tell me that she needed to wash the spider off of her hand, I was secretly laughing. 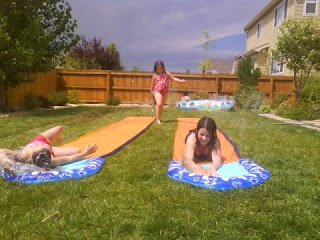 Here are some pictures of the girls and their cousins. When I am finally done posting about our whole trip I will make a collage of some sort with all of the pictures from our wonderful trip. A Butterfly had landed on Jared's back! A Butterfly had landed on Amber's shoulder! While at the Butterfly Pavilion they had an exhibit there where the children could feel like they were the size of bugs. Yea! So here are some pictures of that exhibit.